Bernie Sanders wants Hillary Clinton to break up big banks. Will she? Will the Democrats really break up the banks? Bernie Sanders did a victory lap at the Democratic National Convention Monday. Yes, he lost the race to Hillary Clinton, but Sanders believes he won by shining a spotlight on the "greed, recklessness and illegal behavior on Wall Street." He takes credit for forcing Clinton -- and the entire Democratic Party -- to get a lot tougher on big banks. 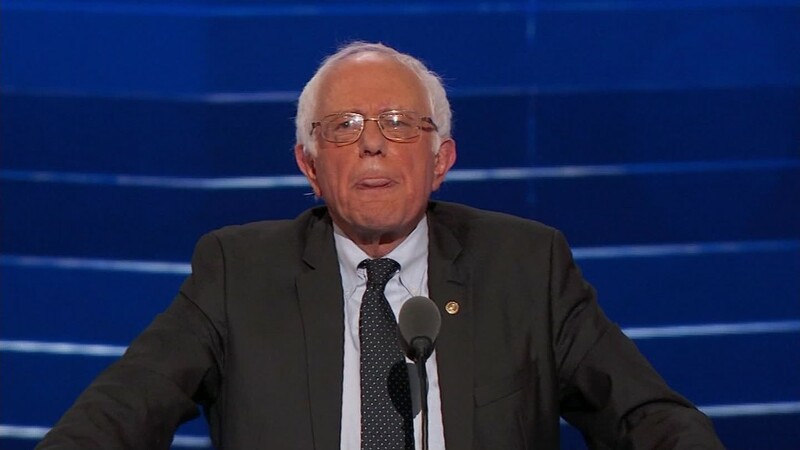 "The Democratic Party now calls for breaking up the major financial institutions on Wall Street and the passage of a 21st Century Glass-Steagall Act," Sanders told the cheering crowd. The anti-Wall Street rhetoric is as high as Manhattan skyscrapers in Election 2016. And not just among Democrats. Republican Donald Trump has slammed hedge fund managers for "getting away with murder" and pushed for breaking up big banks like Sanders. "This is a disgusting, recurring theme designed to create some image that anybody who's in the money and finance business is a bad person," says David Kotok, chairman and chief investment officer of Cumberland Advisors. "But would you like the Chinese model of banking?" The 2016 Democratic platform is a statement of values. It doesn't bind Clinton to do anything. It does have harsh language about banks and vows that Democrats will "vigorously"enforce the Dodd-Frank financial reform law that President Obama signed. But there's also a lot of gray area in the platform. For example, Sanders makes it sound as if bringing back Glass-Steagall is definitely going to happen. Glass-Steagall is a 1930s banking law designed to keep banks small by forcing them to chose between doing Wall Street activities (trading, financing deals, etc.) or Main Street activities (checking and savings accounts and small business loans). President Bill Clinton was the one who repealed the law in 1999, and Hillary has been careful not to fully endorse its return. Related: What exactly is Glass-Steagall? Here's what the platform says: "Democrats will not hesitate to use and expand existing authorities as well as empower regulators to downsize or break apart financial institutions when necessary to protect the public...Democrats support a variety of ways to stop this from happening, including an updated and modernized version of Glass-Steagall." Glass-Steagall sounds like only one possible option for Democrats. Interestingly, the GOP platform does explicitly call for the return of the law. Sanders (and now Trump) frequently bashed Clinton for getting a lot of money from Wall Street. She made millions giving speeches to various banks like Goldman Sachs. Now Wall Street is donating big to her campaign. Clinton has tried to downplay the Wall Street money, but the banking and investment industries have given her campaign (and political action committees that support her) $41.4 million so far, according to OpenSecrets.Org. That makes Wall Street her top donor group. What really makes Wall Street unconcerned about all the bank bashing is that regardless of whether Clinton or Trump is in the White House, the president can't change laws without Congress. And the Republicans are very likely to keep control of the House of Representatives. There's little appetite for more Wall Street regulation in the House. In fact, the 2016 Republican platform calls for getting rid of the "regulatory nightmare" of Dodd-Frank. Wall Street isn't too worried yet. But Alexis Goldstein, a senior analyst at Americans for Financial Reform, thinks banks might be too complacent. She notes that a recent poll show that 75% of Americans think banks need to tougher laws. "I think it's clear that voters are still very unhappy about this," says Goldstein. She thinks it will be hard for either party to ignore the voter outrage.